Alright, alright, I know what you are thinking. A week or more in nature without technology and the conveniences of the modern world can sound like a daunting task for a family, but I’m here to tell you that embarking on a whitewater rafting trip with your kids can be one of the best experiences they ever have. The fun will come naturally, but sometimes it can take a little bit of planning to ensure everyone stays happy the whole trip through. 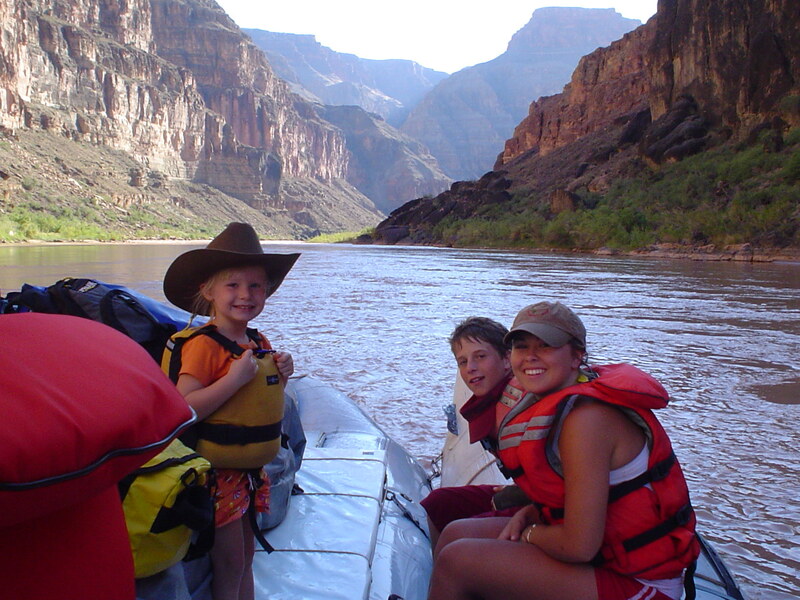 When planning your family’s Colorado River trip with Hatch River Expeditions proper preparation is the key to a fun and hassle-free experience. Here are a few of our favorite tips for your family to prepare for the best summer vacation possible. The #1 way to keep anyone happy, including kids, in the outdoors is to pack properly. Before your trip you will be provided with a thorough packing list. We highly suggest that you stick to it. We also have a short packing video to help—check it out. Items such as comfortable shoes, dry clothes for camp, a hat and sunglasses, sunscreen, lip balm, and warmer clothing for the cooler months are among the essential items. Helping your kids prevent sunburn, keep hydrated, stay warm and dry in the evening hours, and to protect their feet from sharp rocks and blisters on hikes are just a few of the ways to ensure maximum enjoyment the whole trip through. Everyone enjoys their whitewater rafting trip for different reasons. For some it’s the thrill of the rapids and the wildness of the terrain, for others is the multitude of historical and geological sites, or perhaps the relaxing time away from work and life. It’s the same for kids. When taking the whole family on a whitewater rafting trip it is important to find the unique aspects of the trip that will be most interesting to them, and to foster this interest before, during and after the trip. Do they love maps and navigating? Are they little daredevils? Are they more reserved, but super interested in the animals or prehistoric ruins? Do they have an eye for photography or for picking out the constellations? Before your trip, start talking about the cool things your kids will be able to see or do along the way. Get them excited about it. This can be particularly important on some of the longer stretches of smooth water between hiking stops and rapids. Consider making a game of some of the things that will interest your kids. For instance, have them look at a map to see if they can find rock formations, side canyons, or historical sites along the way or to anticipate the next rapid. Or have them keep a sharp eye out for different plants or animals, including some of the many birds that call the canyon home. There is plenty going on around the boat to keep anyone occupied. If your kids aren’t as into playing in the water or hiking the cool trails, an easily packed form of entertainment such as a Frisbee, a deck of cards, or a book could be essential. Proper preparation prevents pouty pipsqueaks. While the Hatch River Expeditions guides are there to help with ensuring the entire group stays happy during your trip, they won’t be able to keep your kids occupied or entertained exclusively. In addition to finding a few things that your kids are uniquely interested in on the trip, it is also very helpful to make them feel like an integral part of the team. As a guest you will jump in and help unload and pack the boats, pitch in with the dishes, enforce and pay attention to guidelines and so on. Some kids really thrive when they feel useful. If they are doing their own dishes and helping transport the lighter items from the boats to the beach and back, their investment in the trip will help them appreciate the fun moments even more. In addition to these great tips, we highly recommend sharing with your children the general itinerary for the trip. Be sure they understand what will be expected on a daily basis, the fun and the more routine. Let them know the water will be chilly and they will be splashed, to listen to the guides and wear their life vests at all times, how they will be expected to go to the bathroom during the day and at camp, and what the meal and sleeping arrangements will be. But also be sure to let them know all the cool things that will be happening on the way. It’s also a great idea to reminisce with your kids about their favorite part of the day at camp or the highlights of the trip on your way home. They will surely have a bunch of stories that they can’t wait share with their friends. If approached correctly the anticipation and adventure of the unknown be an exciting feeling and your kids will be ready to take on the Grand Canyon like a champ. Spending time in the wilderness with kids can introduce a healthy sense of adventure and independence mixed in with a wild imagination and a developing respect for nature that will surely stick with your children for a long time. Call us today to book your kids best summer vacation ever!